Flounder and don’t bake anything for weeks. Then, you get moving. You make something he can truly enjoy, and is doctor approved. And then you make a peach pie. Because honestly, guys, I’m still me. It’s just all about balance. And the simple solution is that James will have a *bite* of pie, and the rest of it will go to friends while he continues to nosh on these muffins all week. 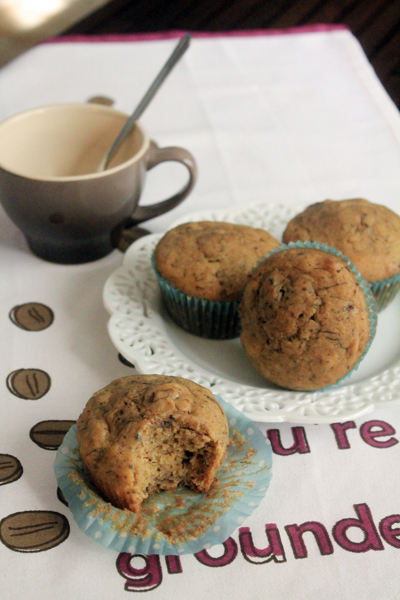 Let’s talk more about these banana muffins. They’re made with olive oil. Don’t give me that face – I was just as dubious. Combined with the white whole wheat, what you get here is an incredibly nutty muffin, whether you put the pecans in it or not. I was terrified of ending up with little hockey pucks, because, you know, whole wheat – but the texture is perfection. Light, even. I promise if you give ’em a shot, you’ll really enjoy them. Bonus: they come together in about 15 minutes. Combine flour, baking soda, and salt. Use a whisk to evenly combine them and aerate the flour. In the bowl of a stand mixer, combine olive oil, Truvia Baking Blend and eggs. Beat well. Mash bananas in a measuring cup until you have 1 full cup. Add to the wet ingredients in the stand mixer, and beat again. Add dry ingredients to the wet in increments, mixing after each addition, and alternating with hot water. Add one cup chopped pecans, stirring in by hand. Line a 12 muffin cup pan with paper liners, and spray both the liners and pan lightly with non-stick cooking spray. Bake for 19 minutes, or until the muffins are golden brown and slightly firm to the touch. A toothpick inserted into the center of a muffin should come away cleanly, with no batter. Allow to cool for 5 minutes in the pan, then remove to a cooling rack and allow to cool completely. 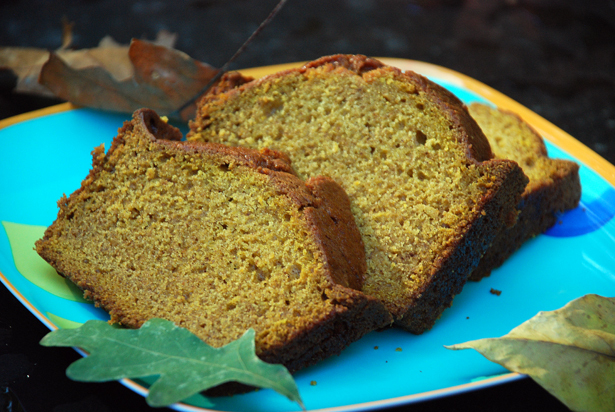 Note: You may substitute 1/2 cup honey, sugar, or maple syrup for the Truvia Baking Blend. I used Truvia because my husband asked me to. Can you sub applesauce for the olive oil? Kristi, I haven’t tried it, so I can’t speak to the results. Please let me know if you do, because I’d love to know too. Did you try the applesauce? How’d it turn out? Really good! I sprayed the cups with Coconut oil cooking spray so they didn’t stick as much to the liner. Thanks for coming back to tell us, Kristi! I’m going to have to look for that coconut oil cooking spray. 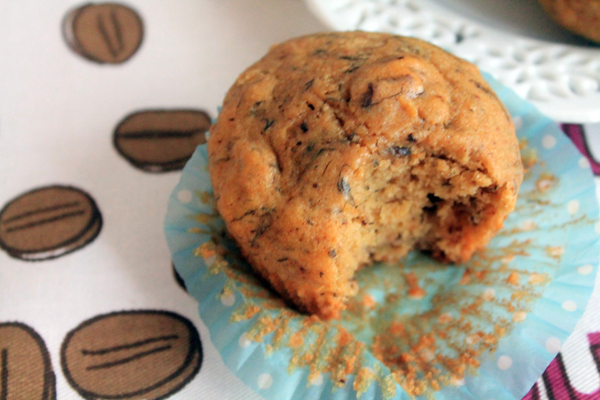 I’ve never made muffins with olive oil before, I may have to try it! Jen, this was my first time too. I was surprised just how delicious it is! Always, Tracy. You could sub in hazelnuts instead, though! OOO these are calling my name! An old coworker use to bring in olive oil banana muffins and they were always so good. These look like a healthier option than hers though 🙂 Can’t wait to make some! Let me know how you like them, Steph! I love baking with olive oil especially in muffins where I think it adds a great depth of flavour and texture. I hope husband is getting to grips with his new diet! I’d never tried it before, Casey, but I’m definitely smitten. I love this recipe! I don’t use Stevia or Truvia but I’d definitely make these with honey. And olive oil is amazing in baked goods as long as you’re not using a really flavorful one. Can’t even taste it! I love seeing recipes like this on other blogs! So fun for me, as weird as that sounds. Erin, I get it. I always get a thrill when I see Tex-Mex recipes on other blogs. I was surprised James didn’t want me to use honey, but I went with what he asked for. I’m making more of these this weekend.. they’re becoming his go-to breakfast.